At the invitation of Deputy Prime Minister Hor Nam Hong of the Kingdom of Cambodia, State Councilor Yang Jiechi will visit Cambodia and chair the fourth meeting of the China-Cambodia Intergovernmental Coordination Committee from 27 to 28 April. China and Cambodia, as neighbors with traditional friendship and a comprehensive strategic cooperative partnership established in 2010, have maintained frequent high-level exchanges and achieved fruitful outcomes in cooperation in various fields. Since 2016, President Xi Jinping and King Norodom Sihamoni have exchanged visits, and Premier Li Keqiang and Prime Minister Hun Sen have met three times, which have greatly advanced the bilateral relationship. Continued development of the China-Cambodia relationship will not only benefit the two peoples but also make positive contribution to regional peace, stability and development. During the visit to Cambodia, State Councilor Yang will meet with King Sihamoni and Prime Minister Hun Sen separately, and co-chair the fourth meeting of the China-Cambodia Intergovernmental Coordination Committee with Deputy Prime Minister Hor Nam Hong. The two sides will sum up and plan for cooperation in various fields during the meeting. We believe this visit will further promote traditional friendship between the two countries and deepen our comprehensive strategic cooperative partnership. Q: The Korean Central News Agency (KCNA) recently published a commentary on 22 April. What is China's comment? A: The relevant side should know very clearly that China's position on the issue is consistent and clear-cut. Q: I have a question about a recent report from the Israeli media which said that China would send several thousand construction workers to Israel for joint projects. The Israeli media said that none of the constructions sites will be part of the West Bank. Can you confirm that? What is China's comment on the choice of the Chinese construction sites? Has China considered placing further pressure on Israel through their economic partnership to uphold the two-state solution? A: We've seen the relevant report. As for the specifics of the project, I'd refer you to competent authorities. I want to stress that since China and Israel established diplomatic ties, the two countries have achieved positive outcomes in practical cooperation in economy, trade, science and technology, culture and other fields. China is ready to continue working with the Israeli side to deepen our cooperation in various fields and benefit our countries and peoples. As you mentioned, the relevant report pointed out that the Chinese workers will not work at the Jewish settlements in the West Bank. China's position on the Palestinian-Israeli issue is consistent and clear. We oppose the establishment of Jewish settlements in the occupied territory of Palestine, and UN Security Council Resolution 2334 has clear requirements in this regard. As a permanent member of the Security Council, China has been making positive efforts for the early peaceful settlement of the Middle East issue, especially the Palestinian-Israeli issue. Q: On the afternoon of 21 April, a military base of the Afghan National Army near the city of Mazar-i-Sharif, capital of the northern Balkh Province of Afghanistan was attacked, killing at least 140 and injuring over 160 people. The Taliban has claimed responsibility for the attack. What is China's comment? A: We are greatly shocked by the heavy casualties and condemn the attack. 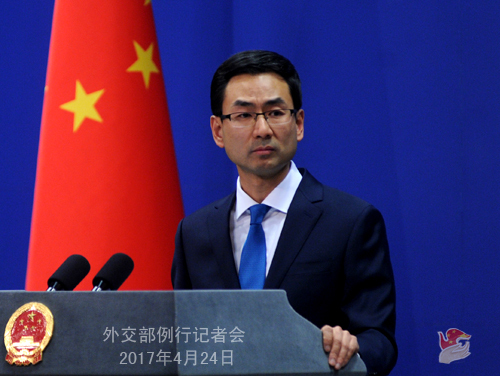 The Chinese side expresses deep condolences over the deaths and extends sincere sympathy to the injured and relatives of the killed. 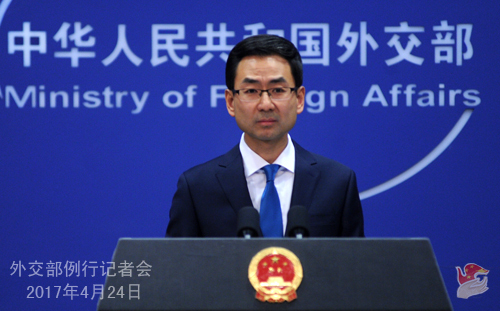 China is concerned about the escalation of violence and conflicts in Afghanistan, and calls for all sides in Afghanistan to participate actively in the Afghan-led and Afghan-owned reconciliation process and jointly uphold national peace and development. Q: On 24 April, ROK Ministry of Defense spokesperson said that the ROK intends to hold a joint military drill with the USS Carl Vinson which is heading towards the Korean Peninsula. What is China's comment? Also, the DPRK may have another nuclear test in the following days. What is China's attitude? A: I will answer your questions together. As my colleagues and I have reiterated here many times, the situation on the Korean Peninsula is complicated and sensitive and the tension is high. We urge all relevant sides to stay calm and restrained, and refrain from any action that may escalate the situation on the Peninsula. Q: Could you tell us more about the telephone conversation between President Xi Jinping and US President Donald Trump? What did the US side say in this conversation? A: President Xi Jinping and President Donald Trump had a telephone conversation this morning, and we have issued a press release about the call. You may ask the US side as for what President Trump said. It is also covered in our press release and I can talk about it briefly. President Trump expressed in the call that he had a very good meeting with President Xi at Mar-a-Lago. He is satisfied with the development of the two countries' relations and is respectful to the Chinese people. It is very important for the United States and China to keep close contact and maintain coordination on major issues. He expects to meet President Xi again at an early date and looks forward to paying a state visit to China. Q: It is reported that the DPRK has detained a US citizen of ROK origin. What is China's remark? A: We've seen the relevant report, and we hope the relevant sides can properly handle the issue. Q: France had its first round of election last night. Does China have any comment on that? A: The French presidential election is French domestic affair and I will not comment on it. Meanwhile, what I can tell you is that we have been following the election closely. I would like to point out that France is a key member state of the EU and also a permanent member of the UN Security Council. In recent years, the China-France relationship has been developing at a high level and played a leading role in the relations between China and the EU and between China and Western countries. China would like to work with France to consolidate political mutual trust, achieve new outcomes in mutually beneficial practical cooperation and better benefit the two peoples. We are fully confident about the prospects of the China-France relationship. Q: The UN Security Council will have an open ministerial meeting on the Korean Peninsula nuclear issue. What is China's response? Will China send representatives to the meeting? Will Foreign Minister Wang Yi attend it? 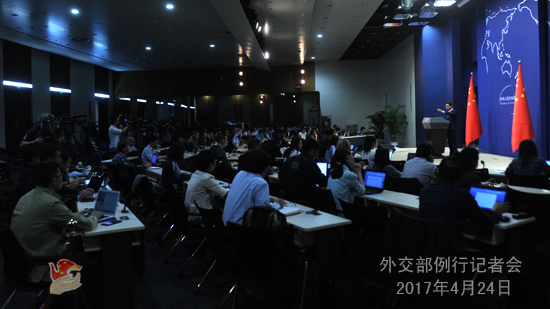 A: China is looking into the open ministerial meeting of the UN Security Council on the Korean Peninsula nuclear issue and will release information in due course. Q: Tomorrow is the 85th anniversary of the foundation day of the Korean People's Army of the DPRK. If the DPRK conducts another nuclear test on that anniversary, what would be China's position? A: I can choose not to answer your question since it is a hypothetical one, but I am willing to reiterate China's principled position. The situation on the Korean Peninsula is complicated and sensitive and the tension is high. We strongly urge all relevant sides to stay calm and restrained, and refrain from any action that may escalate the situation. The UN Security Council also clearly requires the DPRK to stop its nuclear and missile programs. Q: My first question is whether there will be Chinese representatives at the DPRK army anniversary activities tomorrow? My second question is about the telephone conversation between Chinese and US presidents this morning. Why did they have a second call within such a short time? Is it because they have any new assessment of the Korean Peninsula issue? A: About your first question, China and the DPRK are friendly neighbors and have maintained friendly exchanges. About your second question, as you may notice, the two presidents have lately maintained close communication through various channels and the call this morning is the latest example. China and the United States are two countries with major global influence. It is good for both the two countries and the international community that the two presidents maintain such close communication and exchange views on issues of shared interest in a timely fashion. It is only normal if there are more similar exchanges between the two presidents in the future. If you read the press release carefully, you will see that the two presidents agreed again in their call on keeping close contact via various means and exchanging views on issues of shared interest in a timely manner. Q: This morning President Trump also called Japanese Prime Minister Shinzo Abe to talk about the DPRK issue. What do you believe is the appropriate role of Japan in solving tensions on the Korean Peninsula? Do you welcome Japan's involvement? A: Japan is a country in Northeast Asia and a member of the Six-Party Talks. We always encourage the Japanese side to play a positive and constructive role in the settlement of the Korean Peninsula nuclear issue. We have maintained close communication with Japan and other relevant sides on the Korean Peninsula situation. Q: Did President Trump talk about the Korean Peninsula situation during his telephone conversation with President Xi? A: We have issued a press release about the telephone conversation between the two presidents this morning, and I can give you a brief introduction. During the telephone conversation, the two presidents exchanged their views on the Korean Peninsula situation. President Xi stressed that China strongly opposes any act that violates resolutions of the United Nations Security Council and hopes that the parties concerned will exercise restraint and refrain from taking any action that will aggravate tensions on the Peninsula. Only when the parties concerned shoulder their due responsibilities and meet each other halfway can they solve the Korean Peninsula nuclear issue and achieve the denuclearization of the Korean Peninsula as soon as possible. 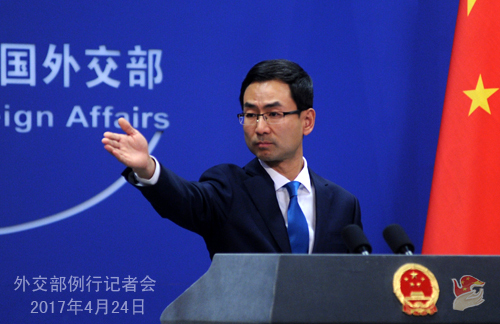 China is willing to work and make every effort with all parties concerned including the United States to realize peace for the Korean Peninsula, for the Northeast Asia, and for the whole world.